I’ll come right out and say it — I’m biased and financially motivated to make this game sell. I want it to fly off the shelves so we get rich, because I’m not just the reviewer, I’m the publisher of the official strategy guide (Prinny Dood!). I don’t have any qualms letting this be known because I feel no guilt over critiquing the game anyway, so long as I am still honest about it. If I can get rich from a game I also love, that’s the stuff of dreams. However, you may want to take that little disclosure into consideration while I gush. I love this game. I have 133 hours on my save file as of this writing, and this review is taking away from precious play time, so hurry up and finish reading so I can get back to playing (I kid, but that’s how addicted I am to this game!). If I were assigning a score based solely on dollars versus replay value, this game would win 5 of 5, review over. The only other games I’ve ever spent this much time playing were Dungeon Keeper (first and second), online multiplayer Unreal Tournament and, of course, the prior Disgaea games. Any game that keeps me entertained for that long pretty much deserves a perfect score because any other complaints don’t stop it from being one of the most entertaining games of all time. With 133 hours on the clock, I still haven’t played about 40% of the game’s levels. Since I’m very experienced with the Disgaea series (I wrote the strategy guide for the first one), I almost immediately over-powered my characters to a point where there was no real challenge in the story levels themselves. I spent very little time on them. That isn’t to say I didn’t play them — no, I just played through them very quickly. I made mince-meat of them. I whipped through them in about 12 hours, which included reading all of the dialog. If I didn’t have a duty to the production of the strategy guide to pay attention to the story, I probably would have skipped through the story and been done with the story levels in about eight hours. Chances are, a fair number of people will do just that. They’ll just play through the story levels, beat the last boss and not pay much attention to the side-stuff and be done (although it’ll probably take the average player about 30-40 hours to do that). For those folks, the game is probably a 3 or 3.5 of 5. For people like me, however, who love whiling away the hours micromanaging their characters and items, building the perfect weapon(s) and making sure everything that is possible to do in a game is done and done to the max, there is more fun here than a person can reasonably expect for their $50. I personally think the side-quest levels are about 14.76 times more fun than the story levels. 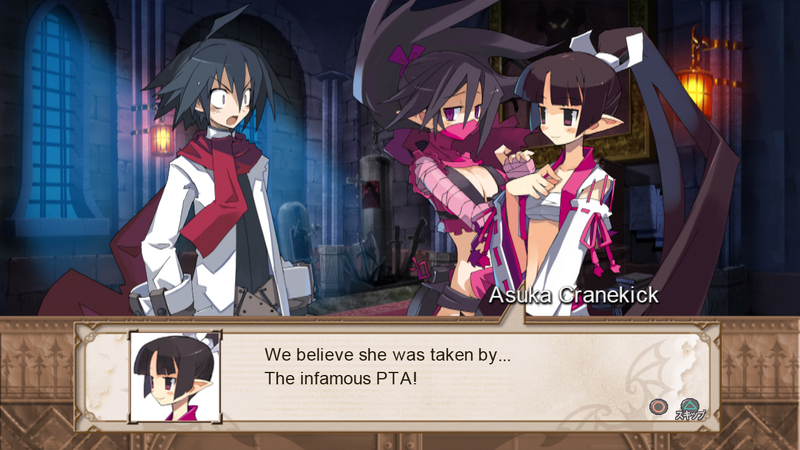 I am not a big fan of anime-type stories and while I appreciate some of the hilarious hilarity in the Disgaea stories, they’re still really not my thing. That said, I think the story in this game is probably better than in the last one and almost as good as the first one. The really fun levels are the “X-Dimension” secret levels (there’s one for almost every story level), which are far more puzzle-like than the story levels. Usually, how much you’ve power-leveled doesn’t help you beat an X-Dimension level because there is some crazy puzzle-solving to do, involving geo-things and bizarre “evilities” that negate your level 9,999 Galaxy Mage’s awesome powers. So if I’ve only played 60% of the game at this point, what the heck have I been doing with the other 121 hours, you ask? I’ve been micromanaging all that time. One of the best things about games in this series is that they somehow succeed in keeping “level grinding” from being boring. 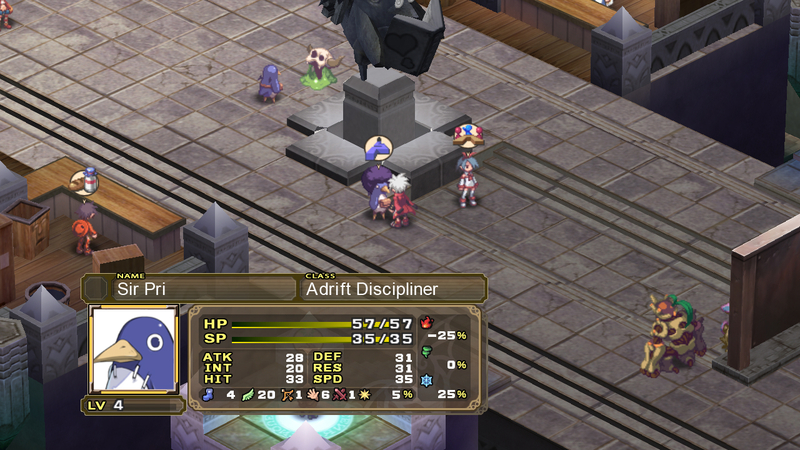 Besides the normal levels, there is the Item World, the Class World and the Netherworld Academy where you can obsess over details until your brain melts. I’ve been spending all my time making the most awesome characters with the most awesome weapons and equipment, with the most awesome skills so I can do terrible, terrible atrocities to the enemies and laugh from my belly while I stand and point at the TV screen scorning them for even trying to stand in my way. I usually am in my underwear when I do this because it’s the middle of summer and the A/C in here doesn’t work very well. God help me if any of my family ever walks in while I’m pwn’ing suckers. Since I really should consider all things besides just the amazing number of hours of gameplay available when giving a score, I will deduct a half point for low-res sprites and another half-point for the story mode being too easy (for me — your milage may vary).